Context: In developing countries like India, where money set aside for public health, is <1% of the gross domestic product, routine use of surgical gloves for examining patients as well as for minor surgical procedures can be a drain on the resources. Hence, we decided to conduct a study to ascertain whether it is necessary to use surgical gloves in routine dental extractions. Aims: This study aims to conduct a study to ascertain whether it is necessary to use surgical gloves in routine dental extractions. Materials and Methods: A comparative, prospective, randomized, double-blind study was carried out in one hundred patients for nonsurgical extractions of multiple teeth, performed aseptically. 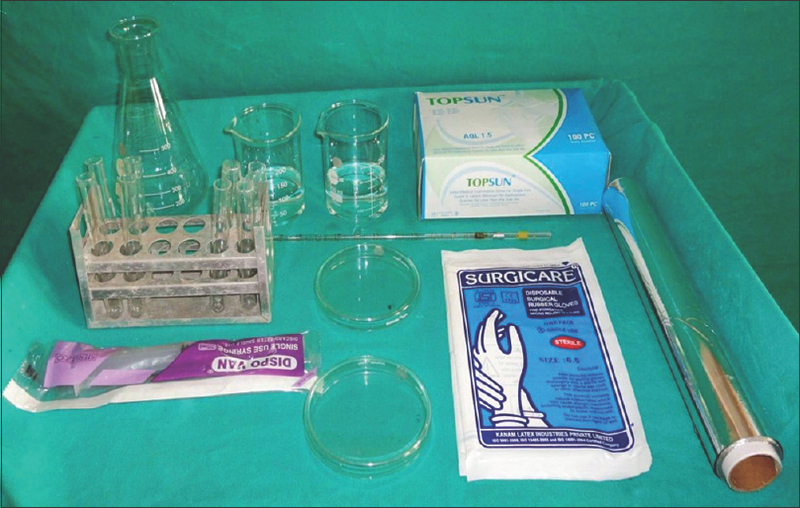 Microbiology specimens were taken from the glove's surfaces according to a standard protocol. An independent assessor, who was blinded for the procedure, examined the patients on the 7th postoperative day. Data were entered into Microsoft Excel sheet and subjected to Statistical analysis using SPSS Version 20. Statistical Analysis: Paired “t”-test, unpaired “t”-test and Karl Pearson's Coefficient test were used to calculate the scientific data and association between variables. A P = 0.05 or less was considered statistically significant while 0.001 or less, as statistically, highly significant. Results: A total of 100 patients who had 356 extractions were obtained at the end of the study. Paired “t”-test showed the highly significant difference from pre- to post-operative colony forming units at 1% level of significance (P < 0.01). 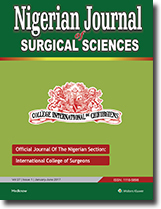 Conclusions: The present study concluded that the use of surgical gloves does not offer a definite advantage over examination gloves in minimizing the rate of infections following extraction of teeth. Aims: This study aims to determine the profile of patients as well as identify predisposing factors of patients presenting with low back pain (LBP) in Irrua Specialist Teaching Hospital Irrua, Edo state of Nigeria. Subjects and Methods: A retrospective study in which case records of all newly diagnosed patients with LBP from January 2011 to December 2013 were analyzed and the following data were extracted: demographic indices, duration of symptoms before presentation, predisposing factors, etc. Results: Within the study periods, 3120 patients presented at the orthopedic clinic, out of these, 101 patients had LBP. The prevalence rate was 3.24%. Median age was 58 years. 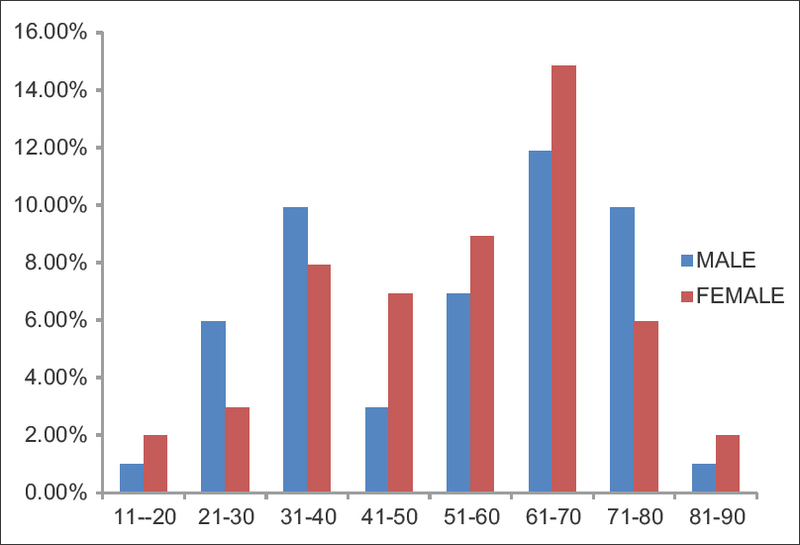 Peak age incidence was 61–70 years. Age range 13–84 years. Male:female 1:1. Most affected occupational age groups were farmers 24 (23.76), traders 23 (22.77%), and civil servants 17 (16.83%). The most common predisposing factors to LBP were trauma to the lower back 23 (22.8%), lifting of heavy objects 11 (10.9%), and obesity 8 (7.9%). Spondylosis was the leading Diagnosis. L4/L5, L5/S1 were the most affected segments The percentage of patients presenting as acute, subacute, and chronic LBP were 28.7%, 9.9%, and 61.4%, respectively. Conclusions: Chronic LBP rank the highest among patients with LBP in our environment. Middle and elderly age brackets were other highlights. Trauma, lifting of heavy weights and obesity were notable predisposing factors. Desmoid tumors are slow-growing tumors derived from musculoaponeurotic tissue. They can occur sporadically or as part of inherited familial adenomatous polyposis (FAP). They are usually seen in women of reproductive age. Desmoid tumors grow and invade surrounding tissues with negligible potential for metastasis. The tumors have higher recurrence rate especially if excision is incomplete. We report a case of extraperitoneal desmoid tumor in a 24-year-old female who had complete excision of the tumor for over 6 months without tumor recurrence. The aim of the case report was to highlight the rarity of such tumor and the role of complete surgical excision in preventing early recurrence. 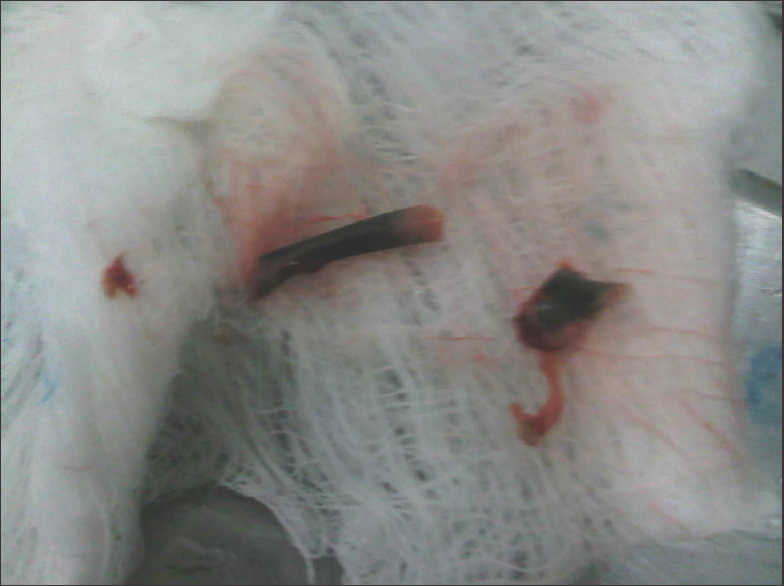 It is generally believed that bones retained freely in the endometrial cavity could behave as an intrauterine contraceptive device. We report a case of retained fetal bone causing chronic pelvic pain in a 29-year-old single Para 0 + 1 female. This followed the termination of a 16-week pregnancy through dilatation and curettage 8 years earlier. Pelvic ultrasound suggested the presence of two highly echogenic objects in the uterine cavity and uterine synechia. Hysteroscopic adhesiolysis and removal of the embedded fetal bone fragments (confirmed by histology) with insertion of size 10 Foleys catheter was performed. She was subsequently placed on estrogen (progynova 2 mg twice daily) for 6 weeks. Her menstruation returned 2 months after the hysteroscopy with complete resolution of the pelvic pain.